I begin with a comparison between the Bayview Hunters Point community of San Francisco, the last predominately Black area to be gentrified in mainly white San Francisco, and the majority white community with its magnificent and Mediterranean estates of Pleasanton, Alameda County, which had the distinction of being named the wealthiest mid-sized city in the Unites States by the Census Bureau in 2005. During the reign of Black Mayor Willie Brown, 1996-2004, the process of gentrification kicked into high gear. The “hook” was a new stadium for the San Francisco 49ers football team and the redevelopment of Bayview Hunters Point. In 2006, the San Francisco Redevelopment Agency Commission voted to place the entire Bayview Hunters Point neighborhood under the jurisdiction of the Redevelopment Agency and the decision was later ratified by the Board of Supervisors. The Redevelopment Plan, which included the radioactive Hunters Point Naval Shipyard, an EPA Superfund Site blighted with radioactive “hot spots” since World War II, would cover 1,400 acres, the largest such project in San Francisco history. The Redevelopment Agency promised to clean up blight, build affordable housing and stimulate business, relying in part on its ability to finance projects with bonds that will be paid off with future property tax revenue. Lennar Corp., a nationwide housing developer with political connections not only to Mayor Gavin Newsom but to Speaker of the House Nancy Pelosi and, more recently, Sen. Dianne Feinstein, both residents of San Francisco, had been chosen by the Redevelopment Agency to be the developer for the project. Opponents feared that the city would take property by eminent domain and that private developers’ desire for profit would drive up housing prices and accelerate gentrification. San Francisco was already pushing its Black population out faster than any other major U.S. city, and Bayview Hunters Point was Black San Francisco’s last stand. The citizens of the community exercised their unalienable right to petition the government to address their grievances and put the whole plan up for a vote by the people. 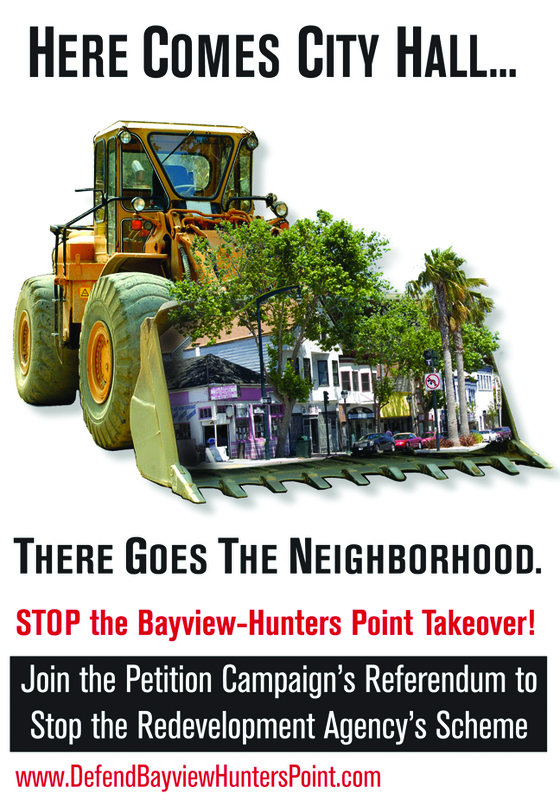 In September of 2006, the city Elections Department certified that the people of Bayview Hunters Point had gathered over 33,000 signatures on their referendum petition, far more than the required 21,615 valid signatures of registered voters to qualify their referendum on the Redevelopment Plan for the November 2007 ballot. City leaders were horrified that citizens actually wanted to let the people decide the question. San Francisco City Attorney Dennis J. Herrera, who had approved the petition before it was circulated, suddenly invalidated it six days after the 33,000-plus signatures had been certified. Although the petition included the full text of the ordinance to be voted on, Herrera said it should also have included all the attachments – a sheaf of papers as thick as a phone book. His opinion was unprecedented – yet unquestioned at City Hall. San Franciscans were denied the right to vote on whether the people or Redevelopment Agency bureaucrats would determine the fate of Bayview Hunters Point. In December, the Defend Bayview Hunters Point Committee filed a lawsuit asking the Superior Court to review and reverse the city attorney’s opinion. The judge had knowingly accepted a campaign contribution from the city attorney, yet he did not recuse himself from the case and decided in favor of the city attorney. The right to petition was formally denied. The appeals court refused to hear the people’s appeal. Now let us return to the affluent city of Pleasanton. In 1992, the city of Pleasanton had first developed a plan to build a plan to build 122 housing units and an 18-hole golf course, but voters vetoed it the following year. What a novel idea – unlike San Francisco, the people actually had the right to vote on such matters. But the city of Pleasanton was determined to proceed with the project with developers Jennifer and Frederick Lin. Opponents, a local group called Save Pleasanton Hills, collected enough signatures for a referendum vote last year, but Alameda County Superior Court Judge Frank Roesch ruled the referendum petitions invalid because they failed to include details of the development plan, such as maximum height of the houses. The developers appealed this decision, and, on Wednesday, Oct. 14, the California Supreme Court denied review. With the referendum reinstated, “the issue will go before the voters next year,” the Chronicle reported. The right of the people of California to petition and to vote was upheld by the state’s highest court. So in this tale of two cities, we have justice denied in San Francisco’s largely Black and poor Bayview Hunters Point – 91 percent people of color – and justice granted to the affluent citizens of 80.44 percent white Pleasanton. In another tale of two cities, let’s compare the protection of the citizens of El Dorado County, where the estimated median household income in 2007 was $116,551, and the citizens of San Francisco’s Bayview Hunters Point from exposure to asbestos dust arising from the excavation of serpentine rock. Serpentine rock, the source of asbestos, is common throughout California and, in fact, is designated the state rock. 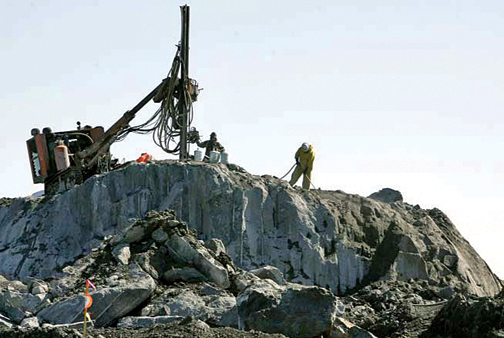 While undisturbed serpentine asbestos is not health threatening, asbestos fibers can be released and become airborne when the rocks are crushed or broken. In this El Dorado County case, samples were analyzed by “transmission electron microscope.” This is very important to note, for an optical microscope does not give an accurate account of the total amount of asbestos fibers in the air. The extreme care taken by state and local agencies in upscale El Dorado County to protect its students, workers and residents from asbestos exposure where serpentine rock is being crushed stands in stark contrast to a comparable health threat in the Hunters Point neighborhood of the City and County of San Francisco. As the infamous Lennar conducted a massive earthmoving operation in Parcel A of the Hunters Point Shipyard, excavating and removing 35 feet of the Hunters Point hilltop, students at a Nation of Islam school immediately adjacent to the Shipyard and at several public schools and child care centers nearby reported a startling increase in asthma and other respiratory diseases, rashes and nosebleeds. Clouds of dust blanketed the neighborhood despite mandates requiring Lennar to suppress it, and residents suspected the dust, laden with asbestos released from the tones of crushed serpentine rock plus other toxins known to be present, was to blame. Development permitted by the Redevelopment Plan their referendum petition had sought to oppose was making their worst nightmare come true, and their children were the first to feel the effects. “1. Anticipatory Action: There is a duty to take anticipatory action to prevent harm. Government, business, and community groups, as well as the general public, share this responsibility. “2. Right to Know: The community has a right to know complete and accurate information on potential human health and environmental impacts associated with the selection of products, services, operations or plans. The burden to supply this information lies with the proponent, not with the general public. “3. Alternatives Assessment: An obligation exists to examine a full range of alternatives and select the alternative with the least potential impact on human health and the environment including the alternative of doing nothing. “4. Full Cost Accounting: When evaluating potential alternatives, there is a duty to consider all the reasonably foreseeable costs, including raw materials, manufacturing, transportation, use, cleanup, eventual disposal, and health costs even if such costs are not reflected in the initial price. Short-and long-term benefits and time thresholds should be considered when making decisions. A few months before this resolution was passed, I testified at a public hearing on the subject at San Francisco City Hall. San Francisco Department of Public Health Director Mitchell H. Katz had stated that the levels of airborne asbestos were safe. I noticed that this section on dust monitoring listed the action level in “milligrams per cubic meter” and so I knew that electron microscopy was not required but rather optical microscopy. On Oct. 11, 2007, I called the Bay Area Air Quality Management District (BAAQMD) office, at 939 Ellis St., San Francisco, (415) 771-6000, and spoke to a Hemant Amin at extension 4633, in the TEC AQ Chemist Laboratory. He told me that “we only test with optical microscopy, since that is all we have at the lab”! So even though California Environmental Protection Agency “Fact Sheet #5 Monitoring for Asbestos” states: “How can you test for asbestos in the ambient (or outdoor) air? A sampler consisting of a pump and cassette holder containing a filter is used to determine the amount of asbestos in the ambient air. Asbestos in the air is trapped onto the filter as air is drawn through the filter. The filter samples are analyzed by counting the number of asbestos fibers on the filters using transmission electron microscopy (ref. Federal Register, 40 CFR Part 763),” San Francisco is in violation of its own Precautionary Principle, as well as state and federal safety laws! On Aug. 7, 2008, the chief executive officer for Lennar in San Francisco, Kofi Bonner, entered into a settlement agreement with BAAQMD Executive Officer Jack Broadbent to pay $515,000 in civil penalties for violations of California Health and Safety Code Section 42400 based upon optical microscopy and not the electronic microscopy used in El Dorado County. So in this tale of two cities, justice is applied to the wealthy El Dorado County as it had been in wealthy Pleasanton. Yet in Bayview Hunters Point, San Francisco’s poorest neighborhood, justice is denied by the courts and by environmental and health regulatory agencies. Ironically, even San Francisco Public Health Director Katz has publicly stated that Bayview Hunters Point suffers from environmental racism. Roland Sheppard is a writer and activist and the retired business representative of the Painters Union in San Francisco. Email him at rolandgarret@aol.com and visit his website, http://web.mac.com/rolandgarret.